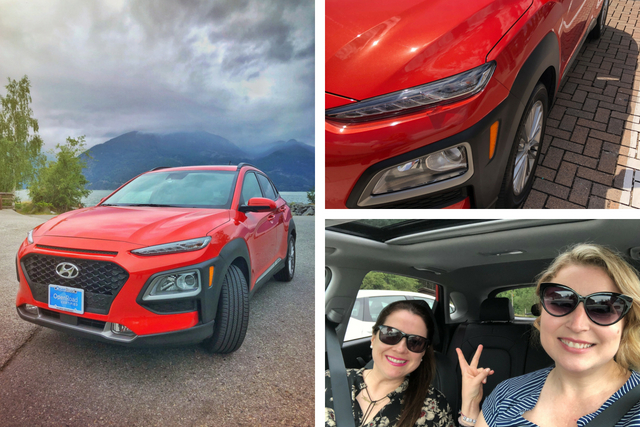 With my destination set to the Four Seasons (for their epic Thursday night barbecues), I rode up the Sea to Sky in style in the all new Hyundai Kona from OpenRoad Hyundai Boundary. Michelle parked her own Hyundai next to mine in a Downtown lot and we carpooled up to Whistler in my Tangerin Comet-coloured Kona. “I have to get new wheels,” she said. “Cause these look so good.” I had no idea that would be the first thing she noticed about our ride! Plugging in my iPhone to activate Apple Car Play, sliding the sunroof back, hopping from Eco Drive Mode in the city to Sport Mode on the highway for more pick-up. This crossover has a lot of pep, and a lot of room – enough for our weekender bags, groceries, and more – and we didn’t even use the organization compartment that sits under the cargo area. We exited the highway at Porteau Cove for a quite picnic lunch, turning into the parking lot at the same time as car club convoy of booming Italian sports cars. We hopped out to enjoy our feast at the picnic tables, and to also take photos of our hot little ride on the edge of Howe Sound. We got a few looks, and many smiles. Lumbar support, touch-screen displays, and the Infinity audio system (and the great company I had) made the rest of the road trip a breeze. Thinking of hitting the open road for an afternoon adventure? OpenRoad Hyundai has a $250 Cactus Club gift card for me to give away to a lucky Miss604 reader. Dine-in, or take out for your own elevated Sea to Sky picnic. I will draw one winner at random from all entries at 12:00pm on Wednesday, July 18, 2018. For more information about the Kona, get in touch with OpenRoad Hyundai Boundary on Facebook, Twitter, or Instagram. Update The winner is Jocelyn! This is not a paid post, views are my own. I had a Hyundai Kona media vehicle for 1 week courtesy of OpenRoad. We’ve taken a Kona for a test drive. Very peppy and we like the looks. Yes please to great food! Entered and liked for Cactus Club gift card. I love this restaurant and it is my favourite. This would make a great picnic! I’d take my sisters for a little Sea to Sky road trip & picnic! One car I have never driven, will take a look next chance I get! Loved my ’09 Elantra Touring Sport! Great quality! The subcompact SUV/CUV market is definitely heating up in Canada. The humble Pony this most certainly is not. I love their food, especially their butternut squash pasta! I love the Cactus Club! Would love to go back to the Cactus Club. Great car!! Love the Cactus Club! Nice car Love the Cactus Club! I haven’t been to a Cactus Club in far too long. Would love to win this for my birthday at the end of the month. CACTUS CLUB as a reward-I want it! Cactus Club is a great place to celebrate a birthday! How’s the mileage on the car? What’s the gas consumption like on this car? Cactus Club is Our go-to spot before or after a movie. Got my new Kona today!! And now I would love love to win the Cactus Club gift card and take my girlfriends for dinner to celebrate my bday next week!!! I like that the Kona has eco mode for the city and sporty mode for the highway, win/win! Would love to take my hubby to dinner! I love Cactus Club! Thanks for the chance! Hyundai has up’ed their game in the car industry. Sad all the comments on the restaurant not many on the car. It is a well built car for an affordable price. I enjoy the Sea to Sky trip. I haven’t done this in years. yes pls! Thanks for the chance to win. This is a perfect prize! I could take my friends out to the Cactus Club and celebrate summer! sounds like a fun trip! Would love to take some friends to Cactus Club to celebrate my birthday! Cool looking car and nice food! Best combo! Road trip to Alberta and Northern BC coming up. Would love to celebrate at Cactus Club. That’s a sweet little car! This would be really handy for entertaining a guest coming from out of town! We have lots of memories about Cactus Club. This is our first dating restaurant. It would be fun to treat my family to dinner out at Cactus Club! GREAT PRIZE! Thanks for the opportunity. Good one, good luck everyone! Would love to visit Cactus Club again! What more can you ask for? Sweet ride & good eats! Love going on road trips and Cactus Club! Good looking car!! Cactus Club is great! Thanks for the contest. Hitting the road to cooler weather at the beach! Love the Cactus Club. What a fun treat! love the content you bring, keep providing value!! you are very appreciated, entered! Love road trips and Butternut Squash Ravioli! This would be great to enjoy this summer! Road trip and Cactus Club with friends….who could ask for more. Travelling along the Sea to sky is a fun day trip – so many places to check out enroute! Of course, Cactus Club patio with some friends is great anytime! I would love to win this fantastic prize!! I love Cactus Club! Have an awesome summer everyone! Love Hondas,Love Cactus patios days with friends! Bellinis and appies on the patio at Cactus Club, fun times! Ooh! Some date nights! Yes….Please! Nice looking car, love the name! Hyundai Kona looks like a great car! The Kona looks awesome. I’ll have to go take it for a test drive! This would be great! Love Cactus Club. This would be great! Love the Cactus Club. Here is my comment!! Hope i win! Love love love Cactus Club! wow! Thanks OpenRoad Hyundai for the great prize! So hot! Must go to Cactus Club! Best prize ever! 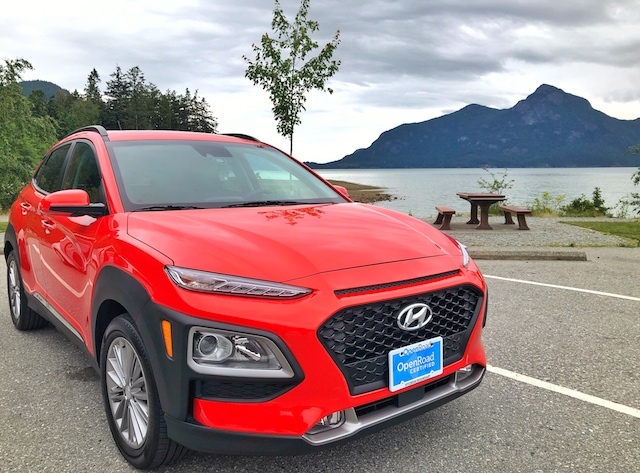 An afternoon adventure with a Sea to Sky ride compliments of Hyundai Kona and a picnic or Cactus Club treat sounds stellar in my books! Such a great prize! Thanks for the opportunity! Ohhhhh, this would be AWESOME! I love, love, LOVE Cactus Club! Thank you so much! Cactus Club is the best!! Looks like a fun and peppy car! Best patios in the city – this would be great!! Would love to win this…Cactus Club is my favorite place to eat!! Would love to win a dinner at Cactus. Planning on hitting the beautiful BC roads all summer. Love the car and Cactus Club is always a good time and great food! This would be perfect for date night at Cactus Club! Love the Cactus Club – it’s our girls get together place! I would love to win. I haven’t been to the Cactus Club in such a long time. Hmm, if I win I will order some Key Lime Pie. What a great contest! I’d love to treat the family to a Cactus Club dinner! Very nice car! Thanks for the chance at the Cactus Club too! Tweeted as well. I would enjoy being able to test drive this car. Looks like you had a great experience. If I won the Cactus Club gift certificate I would love to treat my friends. Hyundai is doing great things with cars! Thanks for the chance of the Cactus Club gift card. One of my family’s favourite restaurant. Love Cactus Club! Great food + drinks + awesome patio weather to enjoy that gift card! Great car! Great restaurant! Yummy contest! Cactus is the best!! I would love to win! This is my favourite drive of all time! I would love to go to the cactus club for my birthday 😄 (July 24th) usually everyone forgets, been to the english bay restaurant once delious food! Plus the fireworks are coming up fantastic giveaway for celebrations. Nice car and great restaurant! this would be a great evening out! It’s my son’s 21st birthday today – going to be one big celebration at Catcus Club if I win!! Would love to visit the Cactus Club! would love to go to the cactus club .except it is to expensive fingers crossed. Sangria and truffle fries..yes please! Ooooo I haven’t been to a Cactus Club in a while! Would love to check out the Cactus Club at English Bay or the Convention Centre, $250 is a lot of Bellinis!!! My favourite dish at Cactus Club is the jambalaya bowl. Tasty and spicy. That would be an amazing gift to my husband, he’s a huge fan for hybrid car !